Ben Shore and Irv Chudnoff opened the doors to Ben & Irv’s Delicatessen in the fall of 1954 on 7701 Ogontz Avenue in the West Oak Lane section of Philadelphia. Customers came from the surrounding neighborhoods of Mt. Airy, Chestnut Hill, Cheltenham and Elkins Park for the finest quality meats, smoked fish and cheese in the city. They were an instant hit in the neighborhood due to their hard work and dedication in addition to the friendly over-the-counter service they provided. This dedication that Ben & Irv instilled upon their employees and themselves inspired Ben’s son-in-law, Len Bromberg and his colleague Marty Margulies to dream bigger. Lenny Bromberg, Ben Shore, Marty Margulies Lenny and Marty opened their restaurant using the same name in the summer of 1984 on County Line Road in Huntingdon Valley. The homemade soups (cabbage borscht, matzo ball and mushroom barley) and corned beef specials became household items in the ‘burbs. Catering for the Jewish holidays, Thanksgiving and Christmas became a staple as they strived to create the best fish and meat trays along with complete holiday dinners in the Delaware Valley. 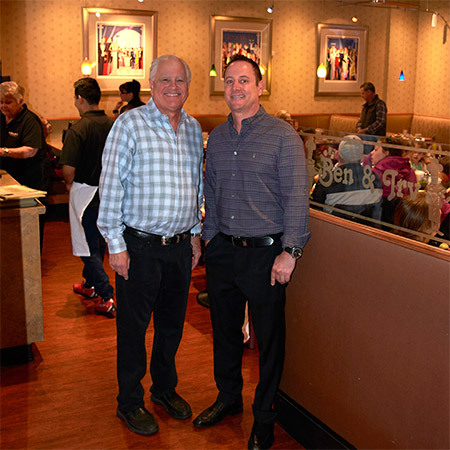 The restaurant moved in 1994 just up the street and Lenny Bromberg and Michael Young continue to provide the same quality food, work ethic, and dedication to our customers that Ben Shore and Irv Chudnoff demanded fifty years ago. And the Ben & Irv’s family looks forward to continuing that tradition over the next fifty years!